I don't know about you but for me one of the really boring items in my home is our towels. I splashed out on beautiful towels when I first moved into a house on my own. They didn't last long between my hair dying and fading or fraying in the wash! So I pretty much go for one colour now. However I am very aware that towels are a necessary but are so not engaging for children, they just aren't fun at all! 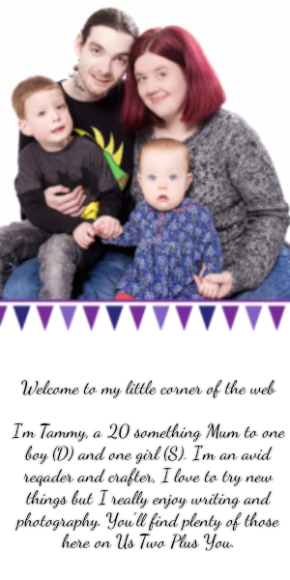 I have been on the look out for a really good hooded towel that is not only big enough to cover D but is engaging, fun and will last for longer than the next growth spurt. I don't like the towels they wear like aprons, not for at home. I recently started to think the one I really wanted just hadn't been made yet. That all changed when I was contacted about the Shark Hooded Towel by Zoocchini from Find Me A Gift. This was the type of towel I have been looking for. Find Me A Gift is an online retailer who specialize in great gift ideas. They have items to cover every occasion you can think of. From Birthdays to retirement gifts they've got it all! They want to find gifts that will be fun and quirky, items that will get you excited to share the gift with the recipient. gives all the information you might need to know about the towel including the dimensions which are approximately 127 x 56 cm. The Shark Hooded Towel looked great and I was so excited to show D who really loves pretending to be a shark during bath time. He got so excited about taking it up for after bath time. So much so he headed off before I was even ready, that'll show me not to bring out such exciting items first. I had managed to finally get the box back (when he got in the bath!) and removed the towel ready for D getting out. Personally I usually do pre-wash our towels however I wanted to get the towel out of the box with D and I knew we'd never get him to wait long enough to wash it. 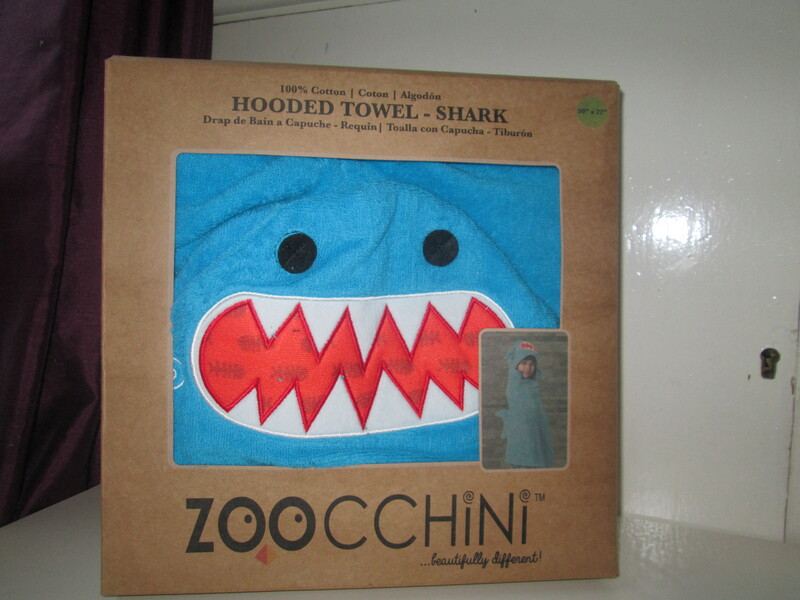 Having used the Shark Hooded Towel by Zoocchini before washing I do wish I had thrown it in the wash. The first use had the inevitable blue fluff stuck everywhere after we got D dried! He however thought it was hilarious and said he was really turning into a blue shark. How cool does it look hanging up too?! The towel was so super soft to touch both on the outer layer and the inner which was a nice surprise. I find some children's towels are really course on one side but soft on the other or are two completely different materials. I love that the towel is soft and is also a good thickness. It's not too thick that in the summer it could make them warmer than needed but also not thin enough that they could get cold after baths or swimming. The hood is also thicker than the body area. I love this! I always find in hooded towels that the hood gets wet through quite quickly and then starts to feel cold. D loved the shark design and it was so beautifully made. You can see the details in every aspect from the thick stitching to the added details. The hood itself features a funky red patterned fabric surrounded by the white fabric teeth which look pretty cool and sharp! You can also find two swirly cheeks beside the mouth and two round eyes not much further up. Incorporated into the edges of the towel you will find the shark's fins, there are two pectoral fins near the bottom edges of the hood at the front and another dorsal fin along the top back of the hood. The dorsal fin stays up most of the time the towel is in use. I had expected it to flop over since it is extra material but it held up really well. There is one final dorsal fin along the back of the towel too. 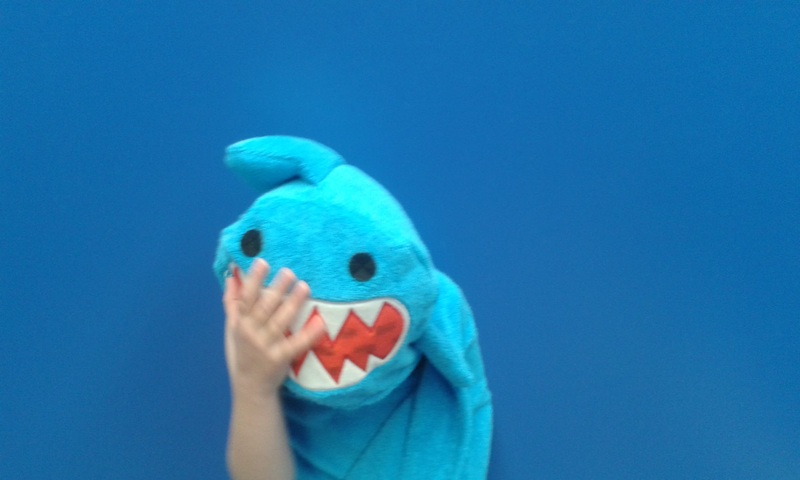 You can see the shark hood details above along with the adorable face palming shark! It is slightly blurry but I had to include it since it's not every day a shark face palms. I thought the towel had a great absorption level and it didn't feel very wet even during our swimming trip when D was sat around for a good 10 minutes which I got everything else ready after going swimming. 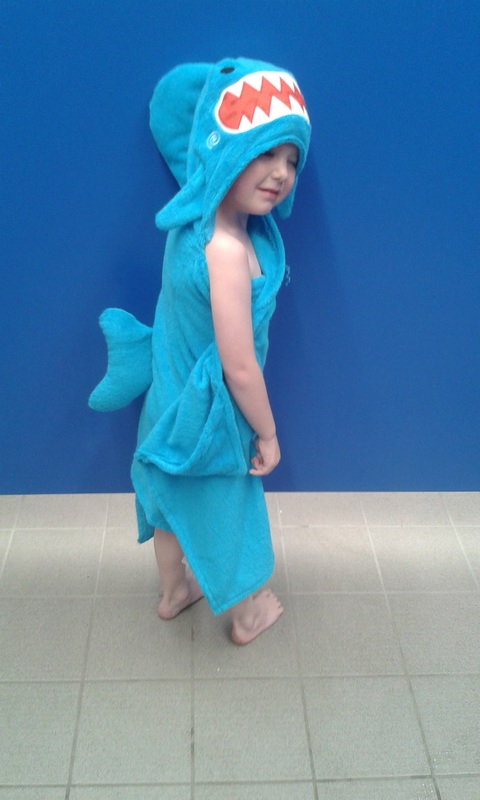 He had lots of fun walking around the changing room making the towel flap using the two hand pockets which are also shaped like the fins of a shark! You can see D holding them up above him after his bath. 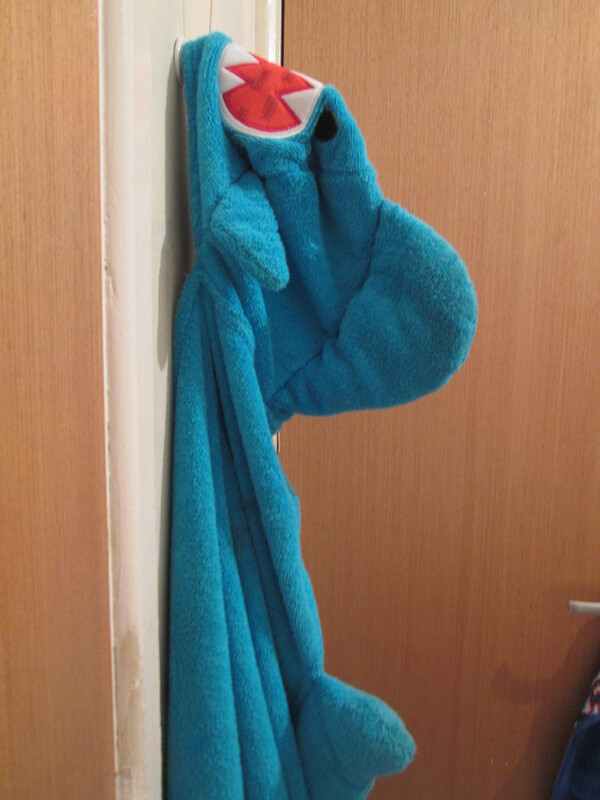 We have washed the Shark Hooded Towel a good few times now and I have not noticed any difference in the towel or the colours. Nor did I have any issues with the blue colour running into any other items. I did have a colour catcher in there just in case. As you can see in many of these photos the Shark Hooded Towel is very large and it still has plenty of room for D to grow into! In fact each side wraps completely around D to double over itself. I can also dry his feet while he's standing up using the bottom corners. I love that this will last him for a good amount of time. 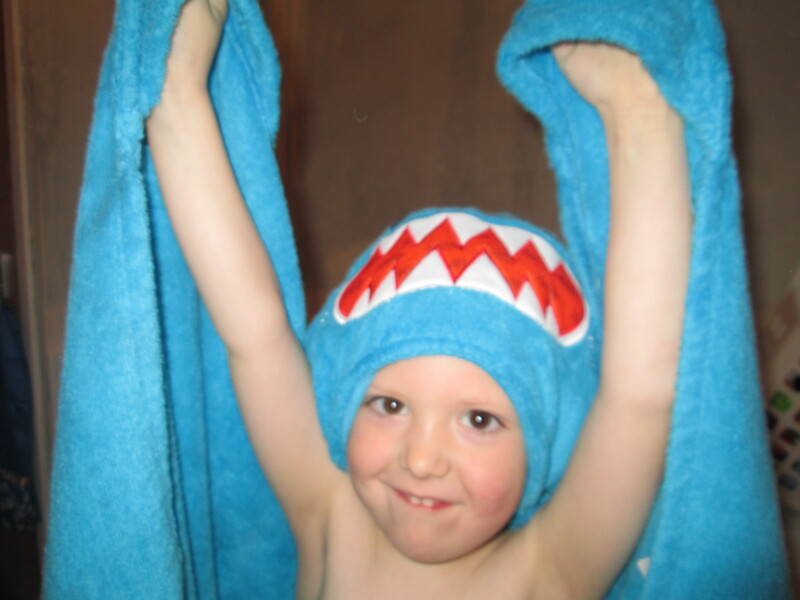 We have loved the Shark Hooded Towel and I can imagine this will be the most used bath item for a long time to come! I would recommend the Shark Hooded Towel by Zoocchini from Find Me A Gift to all parents of children over two years old. Hooded towels are great and this one is so much fun. It really sparks the imagination. I think this towel would also be perfect for children who are going swimming through the school year with the school. There is no way they would get their towel mixed up with another and you know it will keep them warm! Disclaimer: We received this product in return for an open and honest review. All thoughts and opinions expressed above are my own. great review. i'd love one of these for my son.